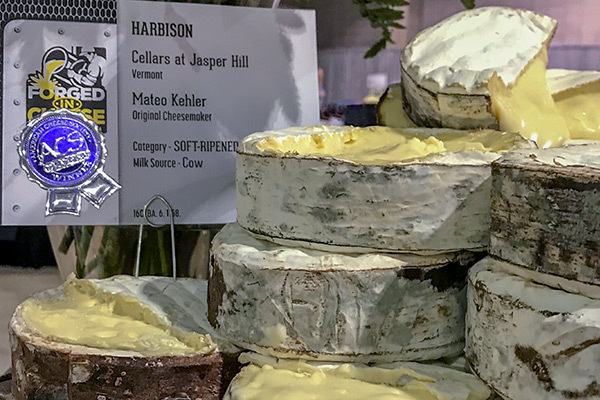 Harbison, a spruce-banded cow’s milk cheese from Jasper Hill Farms in Vermont, topped nearly 2,000 entries to take Best of Show at last week’s American Cheese Society judging. As if that feat weren’t impressive enough, another Jasper Hill creation—Calderwood—placed second. For one creamery to produce the competition’s two top cheeses is beyond astonishing. And Jasper Hill wasn’t done yet. Bayley Hazen Blue, the company’s Stilton-like wheel, earned a blue ribbon in its category. Jasper Hill, an ambitious enterprise run by two brothers in the state’s rural Northeast Kingdom, is arguably the winningest producer in the competition’s 33-year history. Winnimere, another bark-wrapped beauty from Jasper Hill, won Best of Show in 2013. Cabot Clothbound, which Jasper Hill produces in collaboration with Cabot Creamery, won Best of Show in 2006. It’s hard to imagine another creamery surpassing this achievement, although Uplands Cheese Company has won Best of Show three times for a single cheese, Pleasant Ridge Reserve. A ripe Harbison is as goopy as fondue, with heady aromas of smoke, damp cave, roasted cauliflower and butter-browned cabbage. It is widely available. Calderwood, alas, is not, but you can order it from Saxelby Cheese, the sole source for now. It is phenomenal. Mateo Kehler, who runs Jasper Hill Farm with his brother, Andy, spoke with me by phone shortly after the judging. What makes Harbison so runny? Is it cultures? Enzymes? It’s moisture. This is a higher-moisture cheese. Originally, I was messing around with the Moses Sleeper recipe, and I bumped the moisture up. The next morning, I could tell the cheese was going to “pancake,” so I put Winnimere bark around it. It was an accident. Cheese is a discovery, not an invention. 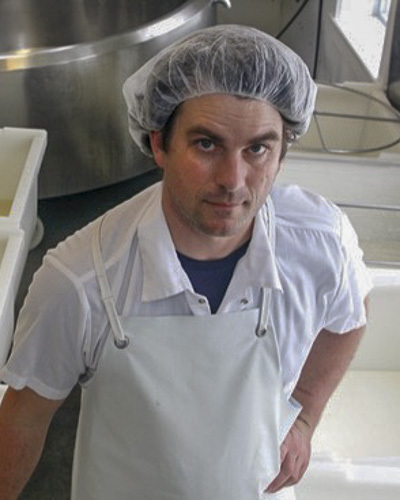 Why do Jasper Hill Farm cheeses keep floating to the top of the ACS competition, year after year? How do you do that? The first line of our mission statement is to be the standard-bearers for quality and innovation in artisan cheese. We have consistently made decisions that prioritize quality over profitability. Employees understand that if we’re going to meet our mission the cheese needs to be remarkable. We get up and reach for the gold ring every single day. We make a lot of cheeses, so it’s a big job to keep them all ascendant. Do you invest more in research than other creameries of your size? Absolutely. I don’t know any other artisan cheesemakers who have a microbiology lab. 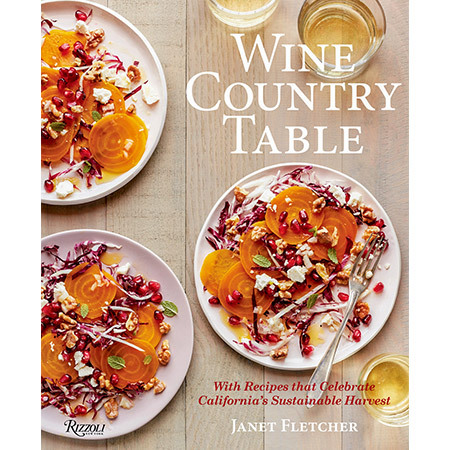 I think of myself as a “professional amateur.” I don’t have any background in microbiology or chemistry, and no cheesemaker training, but we have a lot of curiosity here and want to understand how things work. Personally, I love my job because I get to get up every morning and learn something new. I get a lot of energy out of that, and it ends up being contagious. Your objective at Jasper Hill from the start was to create a model for sustainable dairy farming in Vermont. How well have you succeeded at this? So many Vermont dairy farms are still going under. The fluid-milk market in Vermont is devastating, like everywhere. It’s impossible for us to make a serious impact across the state but we can have massive impact locally. We started 15 years ago milking 15 cows. Today, we are processing the milk from 350 cows and ripening the production from an additional 500. [Jasper Hill employees oversee aging cellars where other creameries send young cheeses for maturing.] We pay twice the current price for the milk we purchase. The farmers we work with would tell you they are in business because we buy their milk. For us, cheesemaking is a lever we’re yanking to culturally, socially and economically transform what it means to live and work in the dairy industry here. But given how successful Vermont cheesemakers are, why are the state’s dairy farms failing? A cow produces enough milk for 1,500 to 1,800 pounds of cheese a year. This year Jasper Hill is going to make 650,000 pounds of cheese. That’s a lot for the artisan cheese industry, but it’s not that much milk. To make an impact, we’ve got to grow the market for specialty cheese.